The Shareprices.com.au website is a FREE-TO-USE stock market website that provides our members with all the latest stock market information and trading tools. 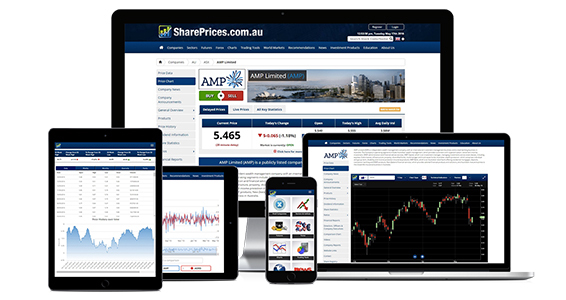 We believe that Shareprices.com.au is the most comprehensive stock market research and information site that is available to the public today. We provide our members with what we believe is the most comprehensive stock market research and trading information that is available today for both the “ASX” Australian Securities Exchange and the majority of the other listed stock exchanges around the world. In Fact we believe (based on our current members website usages) that once you start to use our services you will continue to use our services on an ongoing basis for all your stock market research and trading needs. The latest research and analysis tools. The latest news, interviews and announcements for each public listed company. Complete company statistics including financials and Ratios. The Share Prices websites and trading tools have also been designed to work on all devices. Our mission is to become the world’s largest online stock market directory. We aim to centralise the world’s stock market information by making all the different types of stock market information available on the one simple website service Shareprices.com.au We want Share Prices to be universally accessible in every country and available in every language, so investors and publicly listed companies alike can have all the latest information at their fingertips. We have found that our clients are demanding more and more stock market information that is not readily available on any one website so we aim to solve this problem by continuing to grow the share prices online services by adding more and more trading and research tools to our existing online services to become the worlds largest stock market research and directory service. At Shareprices.com.au we aim to keep our online services FREE for all our members to use however we may also offer our members the opportunity evaluate other additional investment products and trading services that may require an either an upfront or ongoing payment arrangement for these services to cover any licensing, compliance, administration, management, performance and/or brokerage fees. Any fees that may be required from these additional investment products and services will be presented / explained to you directly by a Share Prices authorised representative or a share prices affiliated partner / company. All fees will be will be explained upfront by an authorised advisor and also will be made available to you in writing via the trading products Financial services guides, Product disclosure documents and/or other product applications and/or during any live demonstrations. At Share Prices, we believe strongly in substance over costs. We believe that information is power to any investor and we promise to deliver that information to you. This means you can count on us to find all the information you need on the Shareprices.com.au website without having to spend extra time and money on other confusing hard to use websites. We have invested millions of dollars and countless hours in creating our Shareprices.com.au website services to ensure we are providing a service that the nervous beginner can use right through to the experienced trader/broker..
We promise to keep investing more into research and development so that we can continually offer our members and affiliates the most technologically advanced stock market services and cutting edge trading tools. Every day, our team is researching, updating information and developing new tools. We are continually integrating new technology into our website to compliment the products and services offered by our Affiliates. We are pioneers and strive to maintain an open-minded team culture with fresh ideas. Building such a unique product depends on great people, a lot of them. We are constantly expanding our product offerings and our team in order to make sure we are consistently updating and maintaining profiles, adding more research and developing more cutting-edge tools – our team goes above and beyond every day to make sure our members are getting unbeatable value. *1 – Prices are 20 minutes delayed unless otherwise expressly stipulated.